Pictured L-R: Maria Turnbull (Head of Clinical Services), Storm Cooper (Day Hospice lead), Melanie Hicks (Staff Nurse), Kiren Sharma MBE, Stewart Marks (Hospice Director), Tracey Hancock (Head of Fundraising) and Sue Roberts. Patients have a new mode of transport to get out and about from a hospice in Tilehurst. 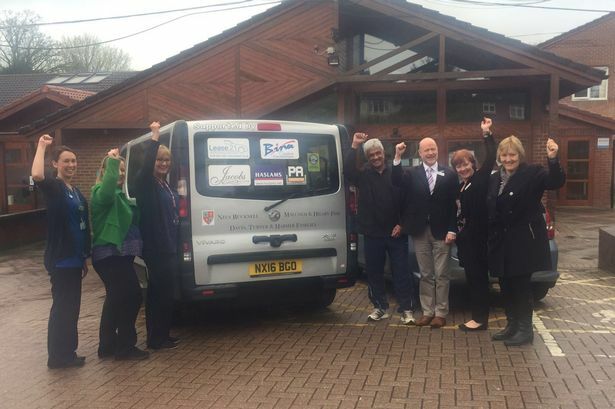 Sue Ryder Duchess of Kent hospice has been donated a specially adapted minibus by two Berkshire businesses. Kiren Sharma MBE, founder of Gravity Personnel, and Sue Roberts from Sue Roberts and Associates, visited the hospice in Liebenrood Road. The pair handed over the key to the first of two minibuses on Friday, April 15. Kiren Sharma MBE said: “We never thought we would raise enough for two buses and would like to thank everyone who supported us. “Lots of people in Reading have a link to the hospice and it really means something to them to be able to help. Mr Sharma was honoured with an MBE for his charity and education work in March. He and his wife have organised fundraising balls for a number of years in Reading. Tracey Hancock, Head of Fundraising at Duchess of Kent Hospice, said: “We’re thrilled to have been given this wonderful new minibus. “It will make a huge difference to our patients who attend day hospice, meaning we can transport them in comfort. A second minibus will be delivered to Sue Ryder Nettlebed hospice in July. There is currently an urgent recruitment drive to fill seven vacancies at the Duchess of Kent hospice. What do you think of the donation? Let us know in the comments section below. Money was raised at a fundraising ball, held at the Reading Hilton in Whitley on Friday, March 4. Earlier this year, Kate Mitchell and Trevor Mourning married at the hospice so the bride’s father could be present.